1. Keep weekends empty. I like to think of these beginning months as a time of rest after the busyness of the holiday season. So I happen to love empty weekends. My main goal for January (besides finishing Whole 30) was to keep all weekends free of having any plans, which I accomplished. That's not to say that I didn't do anything - we still went the first weekend to buy a new TV stand, I still went over for my mom's birthday to hang out at their house - but the point is that I didn't make any plans that (a) were stressful, (b) couldn't be cancelled, or (c) kept me away from the house all day/night. So I was able to still relax and get full nights of sleep. It was great. Try to keep your schedule open so you have free time to just enjoy yourself. Plus, if anything important comes up, you'll be able to say yes. 2. Send thank you notes. If these are still lingering after Christmas, just sit down and get them done. Take this one small thing off your to do list and simplify the mental clutter. 3. Put a doormat out for boots. Know how you can simplify your cleaning routine? Make it so there's less to actually clean. And in this case, make it so you don't have to constantly wash the floors of your entryway by putting mats out by the front door, both outside and in. It's much easier to occasionally throw these in the washing machine than it is to wipe up floors every day. 4. Build a capsule wardrobe. If you decluttered your closet but still feel like there's a lot of clothing in there, try building a capsule wardrobe. You can do this by season, so try it with just your winter items. The idea is to be able to mix and match the pieces you choose so that you have enough outfits for the season without having an overflowing closet. It helps you see how much you really don't need and might inspire you to keep it going throughout 2019. A good place to start is Project 333. 5. Delete Facebook. And/or any other social media that causes you stress. If something stops being fun, it's time for it to go. If people just make you angry or feel envious, it's not worth the struggle. I haven't had Facebook in like a decade, I promise you - you'll be fine. It's freeing. You learn who your real friends are anyway, the ones who still say happy birthday and invite you to events without Facebook reminding them to. 6. Unsubscribe. I think we let e-mail subscriptions get away from us during December, because we sign up for so many store lists while we're online shopping in order to get the discount codes or the tracking information. Instead of just deleting all these sales e-mails clogging up your inbox, take the extra 30 seconds to hit unsubscribe instead. 7. Complete Emily Ley's Simplified Challenge. Each task should take no more than 15 minutes, so you could complete multiple ones in the same day, if you so choose. Each one will greatly simplify your life and you may find something on the list you hadn't even thought to tackle. A good way to finish out January. 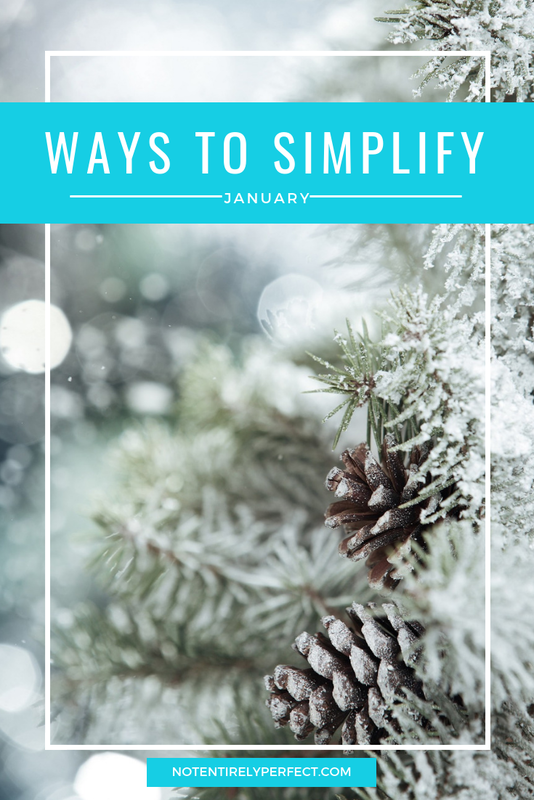 How are you simplifying things this month and bringing less stress into your life?